PRI’s Policy Director, Andrea Huber, recently returned from a pre-deployment training session in Rwanda with the UN Department of Peacekeeping Operations. The two-week training was the first of its kind to invite only female trainees as part of an effort to increase the number of female corrections officers involved in peacekeeping. 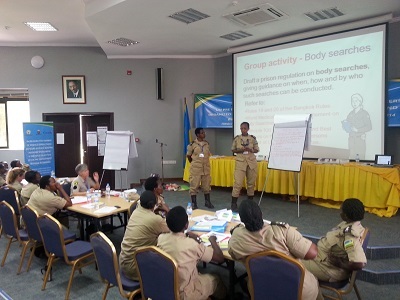 Also for the first time at a pre-deployment training, twenty prison staff from Rwanda, Sweden and Finland received a full day of training from PRI on how to apply the UN Bangkok Rules (the UN Rules for the Treatment of Women Prisoners and Non-custodial Measures for Women Offenders) in prison systems. Participants were invited to reflect on the particular issues facing women prisoners and the measures that could be taken to prevent human rights violations in post-conflict territories where there is a scarcity of resources and a break-down in the administration of social services, healthcare, monitoring bodies and complaints procedures. The training was well-received by the participants and the other instructors, especially with respect to the need for separation of male and female prisoners and considerations related to deciding when to conduct body searches, and how to carry them out with respect to prisoners’ dignity. Participants were also invited to enrol on PRI’s e-learning course on Women in Detention. This free, self-paced course is useful for all professionals involved with women in the criminal justice system and provides a good grounding on all the Rules’ provisions. This workshop is one of many training initiatives PRI is undertaking in its efforts to raise awareness of and support the implementation of the Bangkok Rules into policy and practice.